This 27RBDS North Trail King travel trailer by Heartland RV has everything you need to enjoy your time away from home. You will enjoy the spacious double slide outs, a rear bathroom, a kitchen island, and an outdoor kitchen. You are sure to make plenty of memories on your next camping trip with this model! You will love how open the combined kitchen and living area are thanks to the dual opposing slide outs. Along the door side the slide out features a refrigerator, a three burner range, extra counter space, plus an overhead cabinet. Just past this slide out there is a pantry. Along the roadside the slide out features a sofa and a dinette. The double sink is located at the island. In the front bedroom you will find a queen bed, two nightstands, and an overhead cabinet. The rear bathroom features a sink with a medicine cabinet, a corner shower, and a toilet. Outside there is a kitchen which the chef in the family will enjoy. Here there is a sink, refrigerator, grill, and more! Campers Inn RV of Louisville formerly Tom Stinnett Derby City RV is Campers Inn RVâ€™s 16th location! Tom Stinnett founded Tom Stinnett Derby City RV in 1978. Since then, it has grown into one of the premier RV dealerships in the Midwest, and it boasts the largest interior showroom in the US. RV Business honored the dealership with a Top 50 award in 2014, and it has received numerous Top Dealer awards from a variety of manufacturers. 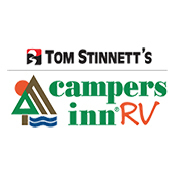 Conveniently located off I-65 with a huge selection of new and pre-owned RVs as well as a expansive parts department we know that you will find everything you need to enjoy the RV lifestyle at Tom Stinnettâ€™s Campers Inn RV!